Adam, my Algebra I student, was recently given A+ Interactive Math's online Adaptive Placement Test and Individualized Lesson Plan program to review. Last school year Adam was in Pre-Algebra. The program we were using was one I'd used with the older three kids and, while we liked it, I knew it wasn't a perfect fit for every student so when he started to struggle I didn't hesitate to have him try a different program. The new, very different, program worked well for a few months, but then he and I both realized it wasn't the right program for him in the long run and we switched back to the original program, starting from the beginning. Things went much better for him this time around, however because we'd made the last program switch halfway through the school year there was no chance of him getting through the entire program by the end of the school year and he only completed just over half the lessons. This year his younger brother, Kaden, is using that same Pre-Algebra program and, of course, Adam really didn't want to be doing the same work as his brother so he opted to go ahead and start Algebra I this year, without the solid foundation he really should have had. This hasn't been an easy math year for him, though I have give him a great deal of credit for working hard and not giving up even when we decided to go back and redo 30 lessons. Right now, with one month or so of school left, he's finally "getting it" and should be able to finish the entire Algebra I program (let me tell you, I'm proud of this kid!). Because of the gaps in his Algebra foundation and the struggles he's had this year I was certain that A+ Interactive Math would be a benefit to him as he could certainly use a little extra practice and lessons from a slightly different perspective are always helpful. Kaden and River also used this A+ Interactive Math program for this review, but my focus, from the time the review was offered, has been on Adam. After doing a few tests and lessons River opted to use a different math review program he was already using, simply because it was familiar to him. Kaden has continued to use Adaptive Placement Test and Individualized Lesson Plan, using the same 7th Grade/Pre-Algebra level as Adam, but at a slower pace. The Adaptive Placement Test and Individualized Lesson Plan program is on online program, for grades 1 through 7 (Pre-Algebra). While Adam is in Algebra I and Eight Grade the Pre-Algebra level proved challenging for him and was a good fit. The program looks for gaps in their knowledge and is tough, both boys were surprised they didn't do better on their initial placement tests but realized that's because they do still have a few things left to learn. The student enters the program and takes placement tests for each related subject. Either he'll do extremely well on the placement test and move on to the next subject or he won't do as well, showing some gaps in knowledge and a need for improvement, and move forward to the lessons he needs to fully grasp the subject. As he does the lessons he can retake the placement test to see if he's mastered the subject. If the student isn't sure how to get started there are helpful videos to watch to guide them into the program. The student doesn't have to take all the placement tests in order and can skip around as he wishes, which can be very helpful as not all math programs move at the same pace. Each placement test or lesson takes about 20 minutes. We found that pen and paper is necessary to do the work associated with the challenging problems. The lessons section provides the student with an individualized lesson plan. The lessons for the tests they've "passed" won't show up here, only the subjects they need work on. Within each subject are many lessons for the student to use to build knowledge. The lessons are videos that clearly and concisely explain the subject matter. At the end of each lesson is a Q&A section to test comprehension. My boys each did four lessons per week, as a supplement to their regular math programs. The parent has his own A+ Interactive Math account to watch the student's progress. While I found the parent dashboard to be helpful, allowing me to see where Adam was in the program, I thought it was a little limited. Adam's school schedule had him doing four lessons per week, I found I couldn't track how many assignments or tests he'd done each week, so I really had no way of guaranteeing he'd done his allotted four and couldn't tell which four he'd done, making it hard to track his progress. I felt that I was "out of the loop" with this program, which, as the teacher, I don't like. "A+ Interactive Math is easy to navigate and if you have trouble you can watch the video that explain how to navigate through the website. You can learn a lot if you take the tests, go through the lessons, and retake the tests. 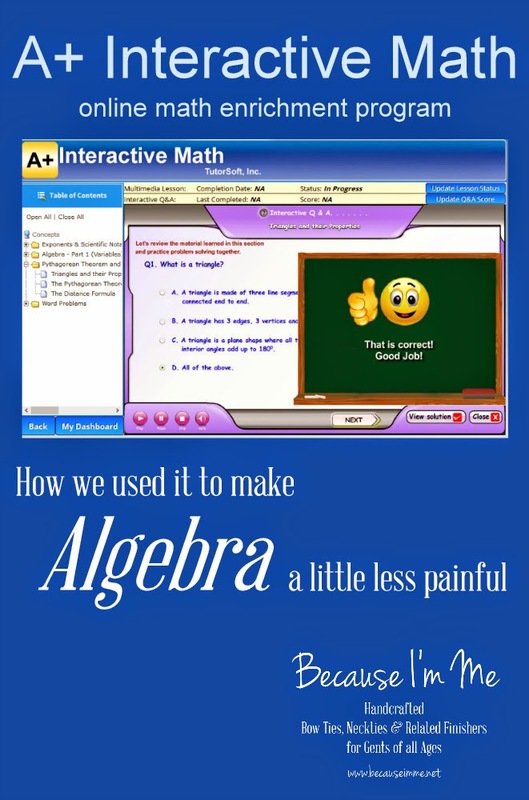 A+ Interactive Math only takes 20 minutes a day to take a test or go through a lesson. I did learn stuff I didn't know, so it has helped me with my Algebra." "Some things I did not know but A+ Interactive Math had lessons so I could learn more. The program tells you about fractions, percents, and word problems. I have learned more about word problems from A+ Interactive Math. I have learned about negative numbers and percents. I think it is a good website." Personally, I think this is a good program for a kid like Adam who needs a little extra to grasp math. He'll be continuing with it through the end of the school year. Additionally, if Adam enters public school he'll have to take an "End of Course" exam for the Algebra he's done this year, if our curriculum didn't cover something or explained it differently this program is helpful for filling in those gaps and differences. My oldest daughter started struggling with math in 3rd grade. She's now in college and still struggling. While it's a little late to send her back to 3rd grade math I wonder, if this program had been available when she needed it, if it would have helped her to understand and to gain some confidence in math. I'd certainly have tried it. Because math is a subject that builds on itself it's really tough on a child when they don't understand a concept(s) early on and get lost trying to build on a foundation that isn't there. I see it as a benefit too for summer enrichment, either to fill in any gaps from the previous year or prepare for the upcoming school year. As I mentioned earlier, I do think the parents area needs to add some more details so the parent can see what the student is doing each day and how they're doing each day. A+ Interactive Math Adaptive Placement Test and Individualized Lesson Plan is available now for $29.99 for one student for a 3-month subscription and just $10 for each additional child. Free resources and more information can be found here.